Alida Topp, age 95 of Hamilton, passed away Tuesday, September 11, 2018. Alida graduated from Hope College and taught school for 42 years in both Iowa and Michigan. 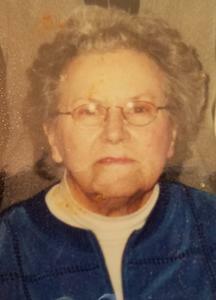 She was a member of Christ Memorial Church. Alida’s family was very important to her; children, grandchildren, and great-grandchildren. She had a very strong faith that sustained her throughout her life. Alida will be remembered for her love of music and the gift of laughter. She was preceded in death by her husband, Leonard in 2010 and a daughter-in-law, Michelle Topp in 2015. Surviving are her children, Beth Topp and Rhonda Rupp, Stephanie and Robert Kazma, Cal and Lori Topp, Jim Topp, and Ker and Melissa Topp; 12 grandchildren and 2 great-grandchildren; several nephews, nieces, and cousins. Funeral services will be 11 am Friday (September 14) in the Chapel at Christ Memorial Church, 595 Graafschap Road, with the Rev. Carole Aardsma officiating.